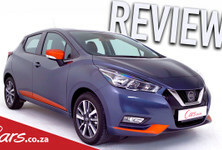 Nissan’s Micra has been something of a wallflower in the compact hatchback segment over the last few years, but the latest incarnation, with its bold styling and sportier underpinnings intends to wrest buyers’ attention away from mainstream rivals. However, is there enough substance beneath that shapely shell to give it a fighting chance? Nissan dealerships regularly offer specials, take a look at new car specials here! Pitched squarely at the likes of the Ford Fiesta and the ever-popular Volkswagen Polo, the Nissan’s B-segment hatchback has traditionally been a solid (but somewhat safe-looking) flanker that’s often appealed to a more mature audience. 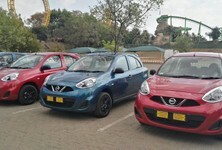 Now, Nissan has taken a leaf out of VW’s Vivo playbook; paring down the previous-generation model and repackaging it as a wallet-friendly entry point to Nissan’s B segment (the Micra Active), while the newcomer moves the goalposts further upmarket, adding more advanced features and a bolder wrapper. 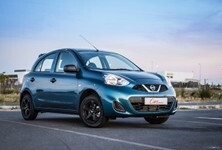 There have been 5 generations of the Nissan Micra, although the model has only been offered in South Africa since 2004. From the amorphous blobs of the first 2 generations (which weren't sold here) to the quirky, squat amphibian form of the 3rd- and the upright-walking (but rather dull) outgoing car, the 36 years of Nissan Micra styling is the automotive equivalent of an evolutionary timeline of life on Earth. Now, in its most advanced form and shorn of even vestigial bits of piscine oddity or mundane metalwork, the new Micra’s sharp lines and rakish profile have transformed it from dowager-dowdy to sporty and youthful, moving it firmly into a bracket where its more attention-grabbing rivals once held a distinct advantage. Hidden rear door handles (in the window frames, in case you were wondering) lend the Micra a sporty 3-door look. It’s a similar story inside, where the previous car’s scratchy plastics and humdrum layout (cues to its more budget-oriented product positioning) have made way for a sportier arrangement that breaks up the harder trim elements with stitched soft-touch panels and a crisp-looking, advanced 7-inch touchscreen infotainment system. Available on the Acenta Plus (of which we show interior pictures here), is an "Energy Orange" interior pack that splashes a bit of colour onto sections of the dash, door linings and seat panels to lift a somewhat monochrome, but certainly solidly-made, cabin. 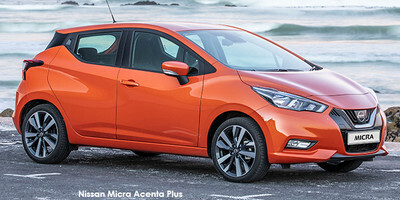 As a product of the Nissan-Renault Alliance, the new Micra shares much of its platform and mechanical componentry with the Clio. The upshot of this mechanical relationship is a car that feels considerably more poised and playful than its forebear. Although town-friendly light in its weighting, the electrically assisted power steering is responsive and combines with a chassis that not only lends itself well to the new car’s proportions, but also does a respectable job of reining in body roll, making the Micra an engaging little car to drive. The Acenta rolls on a set of fetching 16-inch alloy wheels that, in the case of many small cars with a torsion beam rear suspension setup, would normally compromise the ride quality somewhat. But while the ride is firm, the forgiving damping takes a bit of the edge off; striking a fair balance between shock absorption and roll resistance. If you opt for the more expensive Acenta Plus derivative, you can get funky "Energy Orange" contrasting trim inserts. Over and above the 7-inch Apple CarPlay-compatible infotainment system (with MP3 + RDS + USB + AUX), the Acenta Plus comes equipped with auto lights, cruise control (with speed limiter), a 5-inch advanced driver info display, a multifunction steering wheel, air conditioning and safety features such as 6 airbags (front, side and curtain units), ABS with EBD and brake assist, as well as stability control (including Hill Start Assist). If you're willing to fork out R15 400 more for the Acenta Plus model, it features the "Energy Orange" interior trim, a leather-trimmed steering wheel and gearknob, plus 17-inch wheels (the orange exterior strips are part of an optional styling pack). All derivatives, apart from the top-of-the-range Accenta Plus Tech (with an around-view monitor with moving-object detection, forward emergency braking, blind-spot warning and keyless entry and start), have this safety spec, plus a competitive 6-year/150 000 km mechanical warranty, which is the 2nd best in the segment (in terms of length). The Acenta rides on 16-inch alloys as standard. The chassis offers a good blend of ride refinement and engaging handling. In addition to the updated Alliance B (aka Nissan V) platform, the Micra also inherits the Clio’s 0.9-litre turbocharged petrol engine. In the French car it proved a divisive powerplant; some enjoying its 3-cylinder warble and flexibility, while others noted its 66 kW and 140 Nm outputs as being a bit gutless compared with the 1.0-litre 3-pots in the Ford Fiesta and Volkswagen Polo. Its application in the Micra is similarly polarising. While it feels perky and alert, there’s a noticeable degree of turbo lag below 2 500 rpm, meaning a heavy foot is required to build up a head of steam. In an attempt to counter this low-end lethargy, the Alliance engineers adopted a short, close-set gearing arrangement that’s often applied to smaller powerplants with little low-rev oomph. And while it does mean that stirring the snappy gear shifter, albeit while negotiating the clutch pedal’s high biting point, will take off some of that stodginess it does so to the detriment of refinement. Perfect for the plugged-in generation... The audio system features additional inputs for USB and an auxiliary (stereo) audio sources. Even so, the engine’s willingness to spool up beyond the 5 500 rpm, at which the full 66 kW arrives means performance at the top end is respectable. Nissan quotes an average fuel consumption of 5.1 L/100 km, but the hard-worked engine seldom saw that figure, with a still-impressive mid-6 L/100 km being more realistic in everyday driving. Because of the wringing required to extract its best, the engine’s journey to the middle of the rev range sweet spot is accompanied by a rather thrashy soundtrack, and while things smoothen out a bit on the open road, we felt the lack of a tall 6th gear at motorway speeds. It’s not the only discomfort occupants may feel, as, despite a wheelbase that’s around 75 mm longer than that of the outgoing car, rear legroom is rather tight for anyone over 1.75 metres. Thankfully that additional length does incorporate a luggage bay that’s considerably larger than that of the previous car. In December 2018*, the 66kW Turbo Acenta retailed for R268 500 and came with a 3-year/90 000 km service plan (intervals of 15 000 km). You don't need to buy an Acenta Plus derivative to spec orange exterior strips; they are part of an optional styling pack. While it has some shortcomings in terms of mechanical refinement and power delivery from its 3-cylinder engine, the new Micra represents a sweeping and welcome change from its solid, but largely nondescript, predecessor. Competitive pricing, engaging dynamics and arguably some of the best styling in its segment have brought it back into the B segment fray, broadening its appeal considerably. Consequently, the Micra is now a credible (if not quite as mechanically polished) alternative to the likes of the 1.0-litre Volkswagen Polo and Ford Fiesta models. This version is unlikely to melt into the background of the B segment... and its 3-year/90 000 km service plan and 6-year/150 000 km warranty are compelling. In terms of youthful appeal, the closest match to the Acenta. It costs a bit more (R269 900*), has a similar safety spec, more poke and a 6-speed 'box, but doesn't offer cruise control. By comparison, its service plan is valid for longer (4 years), but its warranty is shorter (4 years/120 00 km). The comparatively bland (but much more established) 1.4 Fluid costs R4 400* more. Although it doesn't have as many luxury or safety features (only 2 airbags), nor is it as satisfying to drive, as the Acenta Plus, its 7-year/200 000 km drivetrain warranty sets the standard in this segment. The middle-of-the-range version of Kia's compact hatchback is solidly made and offers such nice-to-haves as electric windows all round, rear PDC, a 5-year/unlimited kilometre warranty and 4-year/60 000 km service plan, but it doesn't have nearly as many safety features as the Nissan. For those who want similarly sporty packaging (courtesy of the 88kW turbo's GT-Line spec), a bit more spec (electric windows all round, keyless entry, rear PDC and navigation) and perky performance (205 Nm, 0-100 kph in 9.0 sec), the Renault (for R12 400* extra) is worth a look. The recently revised Yaris offers more interior space and aesthetic appeal than its predecessor. The 1.5 Xs costs R10 100* less, but in terms of interior quality, the Toyota no longer sits near the top of its segment and its 3-year/100 00 km warranty and 3-service/45 000 km plan are middling. Underpinned by its MQB platform, matched with excellent build quality and premium appeal, the handsome 1.0TSI Comfortline (R270 800*) bests the 66kW Turbo Acenta in terms of refinement, but not luxury features. 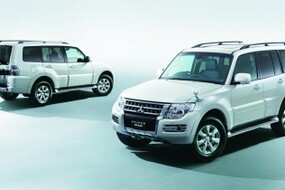 Its warranty (3 years/120 000 km) and service plan (distance) are shorter.